To run a time-sensitive marketing campaign on social media. How Did Gatsby Nails Do It? Gatsby Nails is a small nail salon located in Mexico. 6 months ago they were on the verge of bankruptcy and were about to selling their business. What saved them was running ads on Facebook to grow awareness of their business. As of today, they now have 2 locations with total of 14 employees! With their business losing traction, Gatsby Nails wanted to seize the opportunity to gain new fans and leads on Facebook. Gatsby Nails created a Facebook Sweepstakes using Vionic’s Deal Maker Pro application. The campaign offered fans the opportunity to win a free full set of nails. 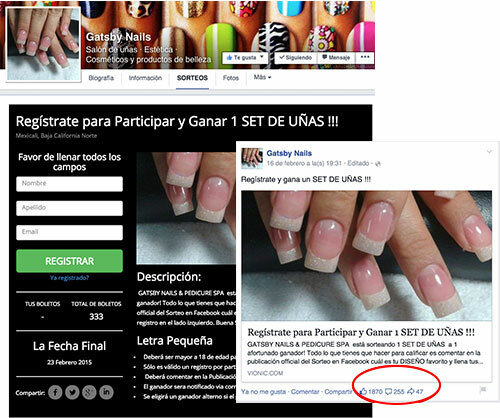 To promote entries, Gatsby Nails gave participants a unique link to share their Sweepstakes with friends. Every time a friend entered through their unique link, the referrer earned an additional sweepstakes entry! With an increase of 172 Facebook Page Likes due to 460 entries, Vionic’s Deal Maker Pro helped Gatsby Nails take their Facebook Page to the next level. Quick to capitalize on their new leads, Gatsby Nails emailed each participant a coupon for 20% off their next purchase at Gatsby Nails!